Set-up is $40.00 per color, per location. 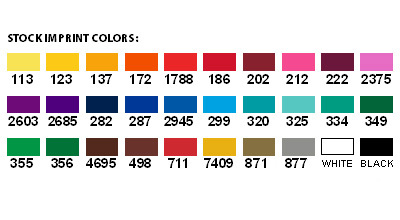 Reorder Set-up is $25.00 per color, per location. Pricing shown includes printing any one stock color on one side. PMS Color Match: $ 25.00(V). Color email proofs are provided at no charge. Pre-production product samples are $30.00 per color plus cost of item. Allow 3-5 working days. Upon approval of product samples, no other set-up charges will apply. 8	 3lbs. 10" x 6" x 6"
10	 4lbs. 12" x 6" x 6"
20	 6lbs. 10" x 10" x 8"
26	 8lbs. 12" x 10" x 8"
38	 10lbs. 12" x 12" x 9"
50	 13lbs. 15" x 12" x 10"
60	 16lbs. 18" x 12" x 10"
70	 19lbs. 18" x 12" x 12"
100	 31lbs. 20" x 11" x 23"
The attached PDF is a copy of the Venturaline AA-100 - Ice Scraper Mittens web-page. Please send a sample of AA-100 - Ice Scraper Mittens to the above address.